Been meaning to get to this one for awhile, but dread the thought of bitching about a movie with so much going for it. Short, sweet and to the point is the my aim for this write up. Short, sweet and to the point also describes the second half of John Favreau’s follow up to Cowboys and Aliens, with an emphasis on the sweet and not enough on the short. The first half of the film is a beautiful thing. Favreau plays the head chef in an upscale bistro. There is strife and drama with his other cooks (John Leguizamo and Bobby Cannavale) as well as his with his wine expert of a hostess played by Scarlett Johansson. It’s the conservative minded, tyrant of a boss owner (Dustin Hofffman) that stifles the chef’s creativity and passion for cooking that really evokes our desire to see said chef pull through, prove that creativity and passion trumps profits and come out the victor. 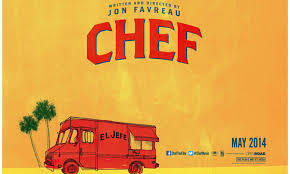 Simple, but effective for a independent movie about the inner workings of a restaurant kitchen. Not since Jack Tripper had I cared so much about an onscreen chef or any chef for that matter. The characters were colorful and the formula effective. This all takes a turn for sappy town as the second half of the movie moves out of the bistro and into a food truck maned by Favreau and his kid. The drama, strife and creative passion gets traded in for Cuban sandwiches and family bonding. The artistic vignettes of food prep that were so effective in the first half disappear and what was a clever device to illustrate the use of twitter through animation becomes so leaned on and overly exposed that it was reminiscent of an old person learning a new function on their phone and then telling everyone about it again and again and again. Ten minutes in to this one I was thinking I’d be seeing it and hearing about it again and again, but due to an errant turn in tone, once was plenty enough for this cynical viewer. Posted on Wednesday, June 25th, 2014 at 2:51 pm and is filed under Reviews.